Tonight I wanted something light as a side dish. So, I took what I needed to use up in my fridge and made it into a most delicious creamy slaw. I say “creamy” because this recipe uses hummus to give it a creamy taste. I like to use hummus in my homemade dressings a good deal as a way to get my creamy dressing taste without the dairy. Ill have to share my Caesar dressing in a different post. This slaw would be a perfect side to some burgers or whatever your grilled favorites are for summer. I thew it over a bed of fresh spinach and made it into a salad, so using it as a main course is an option as well. Extra bonus, its super thrifty for those health conscience on a budget. Using a grater, grate the following into a medium sized bowl. 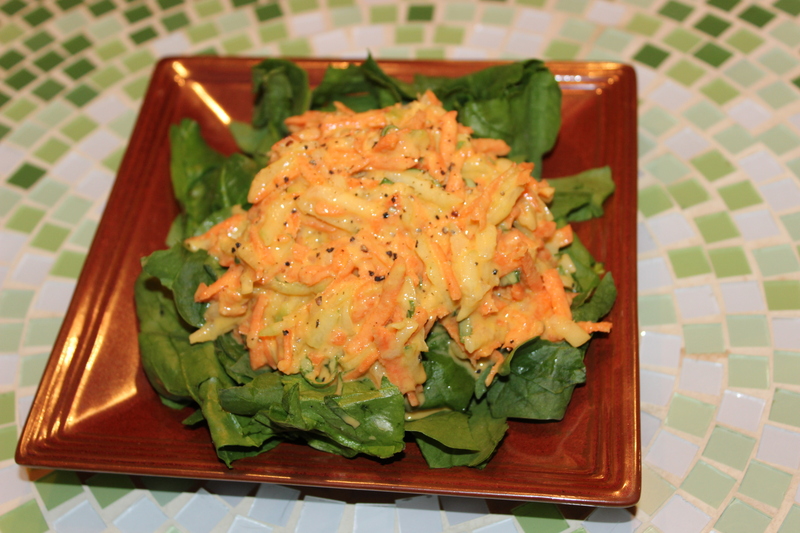 Pour the small bowl of creamy dressing over the carrot/cucumber and toss. Lastly, add the chiffonade basil and lightly toss again. Serve as a stand-alone side or over a bed of lettuce or spinach. Double or triple as needed.